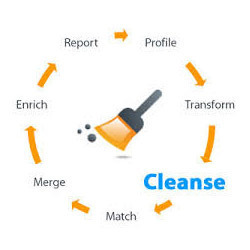 Data cleansing is an important and a vital step performed after data in various forms has been collected from several sources. Our data cleansing solutions help in detecting errors as well as inconsistency in data, remove buds as appropriate and help to improve the overall quality and reliability of the end data information to be delivered to the client. With a significant increase in the velocity and complexity of data being generated, ensuring high data quality that supports business usage has become even more challenging. In this digital era, a business cannot afford to rely on unpredictable, corrupted or mismatched data for making critical decisions. Designed to support the needs of data stewards, IT managers and business users, the Pitney Bowes Software Data Quality and Enrichment suite of data integration, data quality, data governance and location intelligence solutions readily integrate with each other, as well as with your core CRM, ERP and legacy systems.